Harrowing and brutal, Han Kang’s Human Acts is exactly the sort of political novel the world needs in 2017. While her story is specific to a single historical moment, Kang’s account of a violent government intervention in South Korea resounds today as more and more people are finding their voices in city streets, among group chants and cardboard signs. In 1980, a peaceful protest in Gwangju South Korea turned fatal as the police opened fire on crowds, leading to a streak of violence and a still-undisclosed number of casualties. Those who died were disposed of by wheelbarrow and group-burial while survivors were arrested and incarcerated. 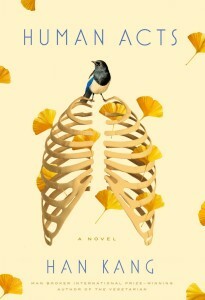 Kang’s novel begins in 1980 following a fifteen year old boy named Dong-ho as he volunteers at the nearby gymnasium-turned-hospital. The wounded and the dead are dragged into piles and carted around, the body count far exceeding what the space and its volunteers can handle. Dong-ho tries to focus but is haunted by recent memories of his missing friend Jeong-dae; he struggles to separate Jeong-dae’s absence with the scenes of violence he’d witnessed first-hand. “They kept clubbing him until his twitching feet grew still,” he recalls of a stranger, wondering if a similar fate befell his friend. At the gymnasium, he lights candles next to the bodies and imagines souls passing through them as their flames flicker. As the novel progresses, Kang focuses episodically on different characters over the course of over three decades. One chapter is told from the perspective of Jeong-dae’s untethered soul, clinging to a pyramid of bodies. Another chapter is about Dong-ho’s mother trying to reconcile his death; he seems to have been murdered not long after the close of his opening chapter. While the novel’s entire cast carries the weight of Dong-ho’s loss, nobody wants to dredge up the horrors of what actually happened to the boy. A chapter about an editor in 1985 focuses on a script that she wants to publish about the Gwangju Uprising but she’s denied by the censorship office. In 2002, another writer aims to publish testimonials from witnesses, encouraging a factory girl to reminisce into a dictaphone. Finally, in 2013, a chilling narrative section appears to come from Han Kang herself, expressing her wish to honor the dead by properly telling their stories. Curiously, with the exception of the 2013 narrative section by “The Writer”, each episode is told in the second person. In one chapter, you are Dong-ho, blanching at the smell of rotten bodies. In others, you’re floating over the dead, you’re fighting with the censorship board. Second person perspective is rarely effective in literature and it appears here with both merits and faults. Despite the awkwardness it lends the narrative flow, Kang effectively emphasizes her readers’ capacity for empathy: by making her story “our” narrative, the loss, fear and frustration of Gwangju is transferred mercilessly onto our conscience. The temporal range of Human Acts shows that while the massacre happened one May in 1980, its repercussions have lingered for over 35 years. Kang not only delves into mankind’s capabilities of carrying the weight of the past. “Conscience,” she writes, “the most terrifying thing in the world.” She proves that the actions of an unjust government can still be felt a lifetime later. But Human Acts is not simply an act of whistleblowing: it is a warning. Actions have lasting repercussions, and political missteps don’t simply swing a pendulum the other way: a continental and worldly imbalance is at stake, shaken by survivors and their ability to remember.